Dante Alighieri (b.1265 - d.1321), Florence, Italy's most famous son, lived during turbulent times. Europe was in the process, sometimes the violent process, of deciding how much influence the church should have in running matters of state. Today's Europe is secular, meaning that church and state are separate, and rarely interfere with each other, and refrain from dictating to each other. Secular states allow for greater religious diversity and greater personal liberty than religious states. But that was anything but the case during Dante's time. 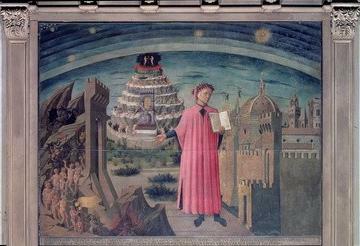 Dante believed in God, and in secularism. He was persecuted for his secular beliefs by banishment from his beloved nation-state of Florence. So Dante, in exile, sought solace in his religious beliefs: he wrote The Divine Comedy. Imagine you had been slighted by many of your friends, defeated by your enemies, and was made victim to the machinations of corrupt leaders and civil servants. Now imagine, what your revenge might be. Dante was not a violent man, so his revenge was not bloody. Dante was a writer, so his revenge took the form of a book, The Divine Comedy, in verse that would both entertain and educate readers, and malign those responsible for his situation. 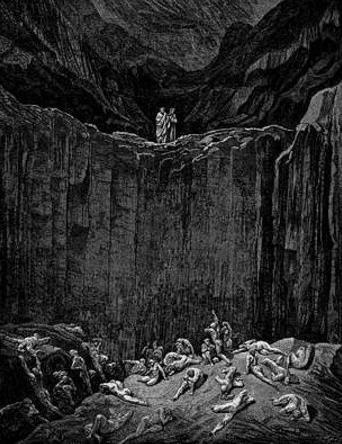 But by making The Divine Comedy a detailed description of Hell, Purgatory and Paradise, and detailing the sins and qualities that land us in each of these zones of the netherworld, Dante ensured that his tale would appeal to readers forever. It's immensely fun, and delightfully satisfying, to read an imaginative account of where your own enemies might end up, and how they'll suffer eternal damnation for what they've done to you during your lifetime. In fact, the most entertaining section of The Divine Comedy is Hell! Dante encourages us to behave better in life, just in case his imaginings are anywhere near the truth of what becomes of us after death. 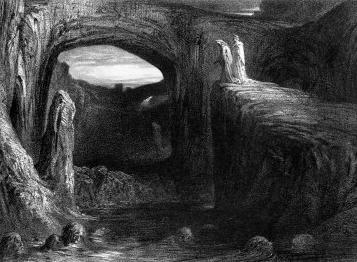 Just like religions themselves, Dante, by illustrating the Christian view of afterlife, gives us hope of rewards after death for self-restraint during life. Justice comes to all, even if a bit late, and it lasts for eternity. To top all that off, Dante accomplished another goal of his, one that he had cherished for a long time. He strongly believed that beautiful literature could be written in the daily language of Florentines. So he wrote The Divine Comedy in ordinary Italian, rather than in the preferred Latin. The book's success did wonders for raising the respect level of the Italian language. Amazingly, Dante's Italian is very readable to student's of today's Italian. It is not like the middle-English literature written in the 1300s, or even like Shakespearean English from the 1600s. 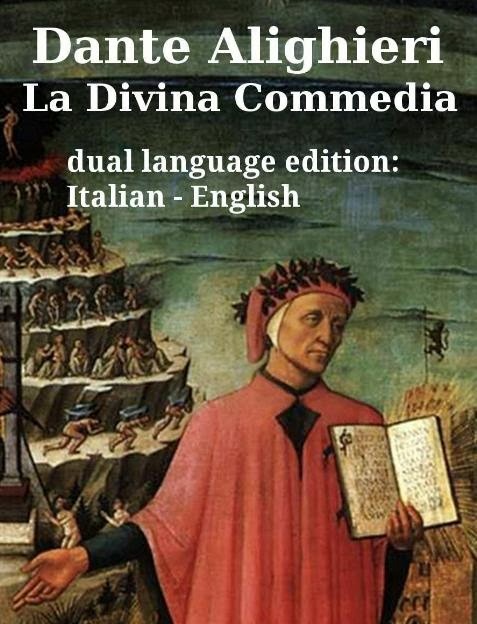 Dante's Italian is accessible, especially when accompanied, side-by-side, by an English translation. But remember, there are scholars who study The Divine Comedy all their scholarly lives. There are books published yearly interpreting everything from Dante's use of numbers, names, places, stars, words, smells, sounds, light, dark, literary figures--oh, you get the picture. But that doesn't mean the average reader cannot enjoy The Divine Comedy. Take my advice: kick anyone who tries to tell you The Divine Comedy is too complex, or that you need an accompanying explanatory book ten times the length of the poem. If you enjoy your first read of Dante's entertaining story, you can always consult those books later. che' la diritta via era smarrita. My advice would be to start with the parts that interest you the most. For most people, that would be Hell. Those wonderful levels of Hell Dante describes with various sinners and their punishments that fit their crimes, are full of juicy, gory details. For the entire text, on-line, English next to Italian, visit my Dante page at Italophiles.com (Candida Martinelli's Italophile Site), my Italian culture site. 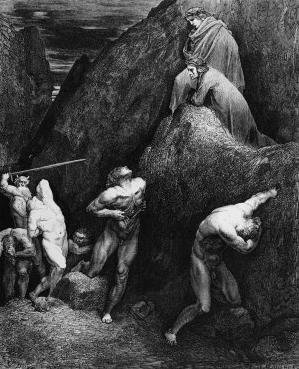 I also include many amazing illustrations by Dore, and links to several on-line resources about Dante. You can download a free e-book of The Divine Comedy from Project Gutenberg, the grand-daddy of free e-book websites. Here is a sampling of paperback books of The Divine Comedy available at Amazon.com, including two dual-language editions.